Newgate Communications will offer insights into the public relations and financial communications industry through the eyes of veteran practitioners. • What is public relations? • Is public relations the right career for you? • What are the different practice areas? • What are the differences between in-house and agency roles? • What challenges will you face as a practitioner? Following the talk, light refreshments will be made available and students will be able to network with Newgate Communications representatives. This talk is open to all undergraduate and post-graduate students. Headquartered in London, Newgate Communications is a public relations agency that specialises in corporate communications, financial communications/capital markets, and public affairs. Our Singapore office is helmed by some of the most experienced public relations and investor relations practitioners here. We have a roster of blue-chip clients, many of whom have worked with our consultants for over a decade. We maintained our position as the leading PR advisor on M&A deals in Singapore, and were ranked #3 across the Asia-Pacific in 2017 by Mergermarket. Our regional teams advised on 23 transactions worth US$39 billion, 14 of which were handled by our Singapore team. 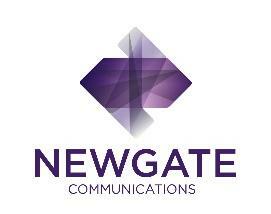 Terence leads Newgate Communications in Singapore and South East Asia. Since joining the public relations industry in 1999, Terence has built up significant experience advising on long-term strategic profile-raising, reputation management and issues management programmes. He has advised a wide range of clients including MNCs, regional governments, private banks and family organisations. Prior to establishing the Singapore office of Newgate Communications in 2013, Terence spent 13 years with Gavin Anderson & Company, which later became Kreab Gavin Anderson. Clarence has almost two decades of investor relations and corporate communications experience, and possesses a strong track record in building and protecting corporate reputations from both in-house and consultancy perspectives. Clarence previously spent over a decade in senior investor relations positions with high-profile listed companies. During this period, he worked on numerous M&A and capital raising transactions, developing and delivering strategic investor relations and corporate profile-raising programmes. Clarence has been an adjunct faculty member at the Singapore Management University since 2014 (COMM360 Investor Relations). 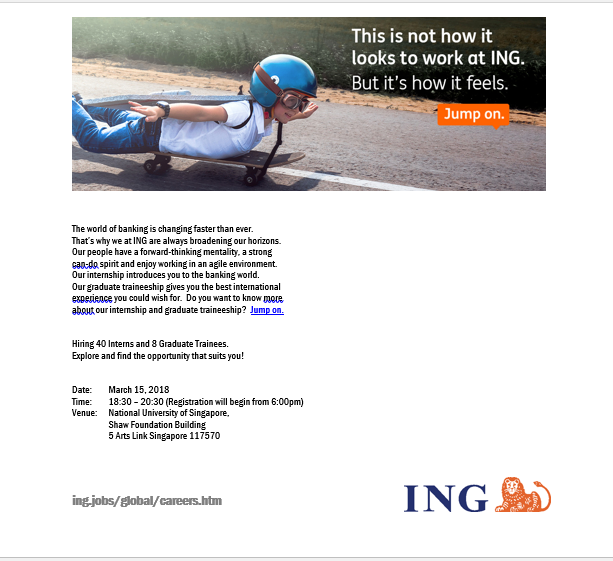 ING is coming to FASS to talk to you about joining them on 15 March 2018, 6:30 – 8:30 pm, at AS7-01-17 Seminar Room B. 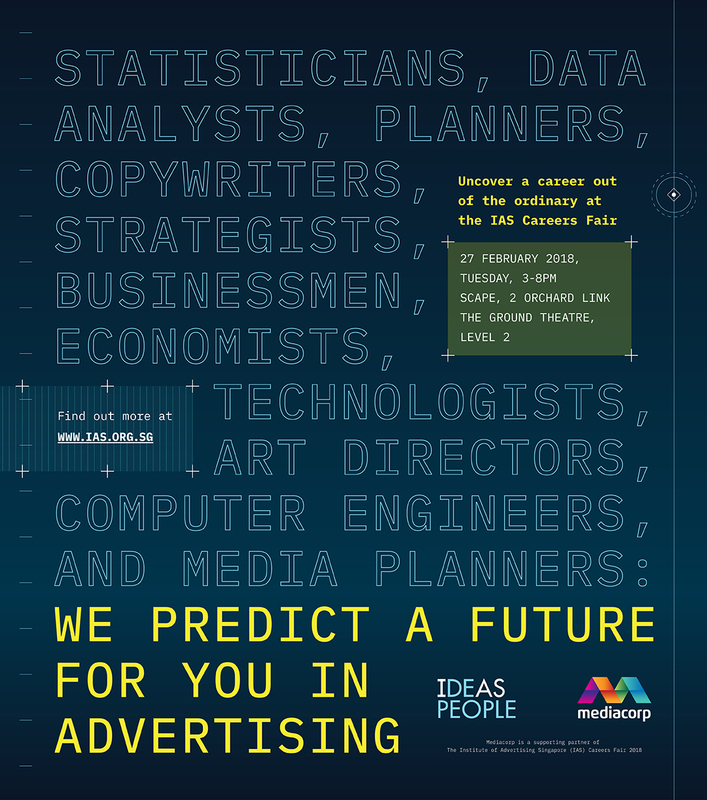 To sign up for the ING talk, go to https://mysurvey.nus.edu.sg/EFM/se/548BF7FB27E65C69.